It is the summer of 1995. I fly into Bozeman, Montana with a friend. We drive southeast on our way to Yellowstone to explore the extremely scenic Beartooth Highway along the northern Wyoming border. We have heard it is the most beautiful drive in the U.S., and we confirm the accuracy of the assessment. 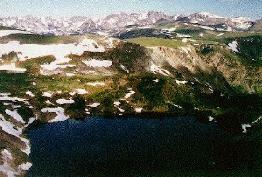 We take a 12-mile day hike (see photo) along the Beartooth National Recreation Trail. The trail is superlative. We find that breathing the cool, dry air up there in the Rockies is exhilarating, after years of hot and humid weather in Florida. The Beartooth range contains the nation's largest contiguous land mass over 10,000 feet. It contains 69 of the 100 tallest mountains in Montana. Of those 69, 29 of them are a breathtaking height of over 12,000 feet.